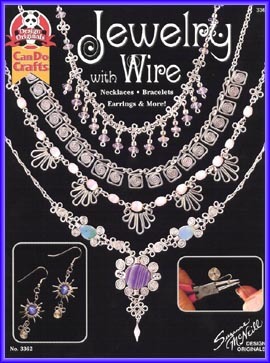 Jewelery with Wire: Necklaces, Bracelets, Earrings and More! Home > **Tools** Books, Wire, Cord, Thread & Supplies > Books > Books on Beading > Jewelery with Wire: Necklaces, Bracelets, Earrings and More! When a project looks so gorgeous, it doesn't seem like it should be easy to make! That's why the looped and turned pieces of wire that make all the exciting jewelery pieces in this book are amazing. Information on tools and techniques as well as instructions on over 50 projects.